D-Mannose, Garlic, and homeopathy to supplement UTI treatment & prevention. Important disclosure: While there are numerous over the counter UTI products, the FDA only approves antibiotics as a treatment for a urinary tract infection (UTIs). Also, while you can buy many supplements and homeopathic remedies without a prescription (aka “over-the-counter”), the official definition of an over-the-counter drug is slightly different. Only when the Food and Drug Administration (FDA) recognizes the safety and effectiveness of an ingredient for a particular diagnosis, then a product containing the said ingredient in an appropriate amount could be called an over-the-counter drug for the specified illness. This is not the case with most products containing D-Mannose, cranberry, or Uva Ursi. Also, if you are looking for an over-the-counter solution for your UTI because you are tired of antibiotics, know that there are some safe non-antibiotic drugs available with a prescription through a compounding pharmacy, such as SSKI. So, what if you can’t get your hands on the right antibiotic immediately? Or what if you’re stuck in the middle of nowhere and can’t see a doctor right away? I’m sure you wonder if OTC UTI medicine works and if it can cure the infection. The answer is “maybe”. First of all, there are three groups of UTI over-the-counter products available without a prescription. Products that reduce symptoms but do not cure the infection (made by big pharmaceutical companies). Natural remedies that you won’t find in pharmacies, but rather in stores like Whole Foods, Sprouts, and on Amazon. Supplements that could help prevent your UTI from recurring. By the way, if you are looking for an OTC UTI solution because you are uninsured, try this $20 online prescription service, licensed in 25 states (this is not an affiliate link). In most cases, antibiotics are required to kill the bacteria that cause a UTI. If left untreated, a UTI can spread to your kidneys or enter your bloodstream, causing a severe infection. This can require hospitalization and IV medication to save your life. Infections that spread to the kidneys can cause permanent damage and even life-endangering sepsis. This is a quick test to help you determine if you have a UTI. If you have the tell-tale signs of burning when you pee, urgency and frequency, it may be best to just get a urine culture since OTC test strips are not very accurate. While the Azo strips are similar to the one used by your doctor, your doctor should always verify the test results with a wet mount microscopy test and urine culture. You only need to verify that your treatment is successful if your symptoms don’t go away. You can still have a positive Azo test, even if your UTI is gone, which may mean unnecessary additional antibiotics. If you do use the Azo strips, make sure to test your urine before taking AZO or Cystex pills as they might affect the accuracy of the test: AZO Urinary Tract Infection Test Strips. Are OTC UTI test strips accurate? If your test is negative, but you are still experiencing UTI symptoms, you may still have a UTI. OTC UTI test strips are actually not that accurate when you have full-blown UTI or if you have a history of frequent UTIs. Since these tests were designed as a screening tool, not a diagnostic test, the might show you wrong results (when a test is a false positive or false negative). When is OTC UTI test more accurate? Phenazopyridine hydrochloride is the active ingredient of this OTC medication for urinary pain, a chemical which, when excreted into the urine, has a local analgesic effect. AZO Urinary Pain Relief® Maximum Strength Tablets, unfortunately, does nothing to fight the infection, but only masks the symptoms. Do not take it for longer than three days and don’t take it if you have liver problems. If you “cover up” your symptoms, you might not notice that your UTI is getting worse. Phenazopyridine is also responsible for the bright orange color of your urine, that indicates the medicine has reached your bladder. Make sure to not wear white underwear or contact lenses (yes, you read that right), since this active ingredient can permanently discolor them. Keep in mind that some animal studies demonstrate a possible link between phenazopyridine and cancer in female rats. “Phenazopyridine hydrochloride is reasonably anticipated to be a human carcinogen based on sufficient evidence of carcinogenicity from studies in experimental animals” according to National Toxicology program report. AZO Urinary Pain Relief® Maximum Strength Tablets contains 97.5 mg of Phenazopyridine per dose. Similar to the previous product by AZO, this one contains Phenazopyridine as an active ingredient, just a lower dose (95 mg). Therefore, AZO Urinary Pain Relief has the same side-effects and method of action. It is also purely analgesic, containing no antimicrobial ingredient, and is sold at a lower price, as it contains less Phenazopyridine per dose. There are no other ingredients that add value and the same possible carcinogenic effects associated with using Phenazopyridine. This is a relatively new OTC drug that has appeared in 2016 in pharmacies all over the USA and also could be ordered on Amazon. Once you swallow it, Methenamine (the main active ingredient) will work by slowing down the growth of pathogenic bacteria in the urinary tract. When exposed to acidic urine, Methenamine turns into formaldehyde to kill the bacteria, but it’s not strong enough to eliminate an infection completely. It can’t cure an active infection but may slow down its progress. AZO Urinary Tract Defense™ has been created to prevent UTIs, as well as to provide quick relief at the first signs of infection. On top of this, Sodium salicylate, an analgesic, also acts as a non-steroidal anti-inflammatory drug (NSAID). Taking an NSAID could help to reduce inflammation while fighting a bladder infection. This analgesic, though, will not change the color of your urine and is not linked to cancer. Quick Tip: In order for AZO Urinary Tract Defense™ to work to its full potential, you’d need acidic urine. For that, take Ascorbic Acid (Vitamin C) with the drug. An alternative to AZO Urinary Tract Defense™ in Canada, Europe, or Australia is Hiprex, which works similarly. Cystex Urinary Pain Relief Tablets is yet another product that contains Methenamine, and therefore works in the same way as AZO Urinary Tract Defense™. The dose of Methenamine in both products is identical (162 mg) and both contain the same amount of Sodium salicylate (which is a sodium salt of salicylic acid). Cystex Urinary Pain Relief Tablets will not change the color of the urine as some other OTC medications do. This is a tricky product that has some useful ingredients, right alongside its marketing gimmicks. The ingredients include:: Cranberry Concentrate, D-Mannose, Sodium Ascorbate and Ascorbic Acid (as sources of Vitamin C), FOS and Bromelain. Other ingredients include filtered water, glycerin, malic acid, l-glutathione, natural fruit and vegetable color, sodium benzoate and potassium sorbate (preservatives), sucralose, and ethyl maltol. I would recommend buying Cystex mainly because it has D-Mannose and it’s not easy to find D-mannose in a conventional pharmacy. So if this is your only option, go for it. I personally do not appreciate that it contains sucralose and preservatives. Plus it is unclear how much D-Mannose it actually has. All this makes it a very expensive and questionable D-Mannose cocktail. Haven’t heard of D-Mannose? Here is my interview with Dr. Wright, who was the first physician in the USA to discover D-Mannose and regularly prescribes it to his patients since the 1980s. When the infection starts, your bladder responds by becoming inflamed, and that’s why you experience pain and increased the urgency to urinate. Ibuprofen has analgesic and anti-inflammatory properties and, it’s argued, could help you cope with the symptoms while your body fights the infection. A couple of studies (here and here) show improved results and shorter symptoms when a patient used Ibuprofen to treat uncomplicated UTIs. Patients that had success with this treatment took 400 mg, three times a day for three days. However, while some patients were able to resolve their UTIs with NSAIDs, the rate of kidney infections in the group using Ibuprofen was higher than in the people who took antibiotics. Pay attention to any flank pain if taking Ibuprofen as a UTI OTC treatment. Remember, If you choose to self-treat a UTI with an NSAID you might be at a higher risk of kidney infection. D-Mannose is a naturally-occurring sugar that is safe to take, has almost no side-effects. You can start taking it immediately since it is available as an over-the-counter supplement. D-Mannose works by adhering to E. coli bacteria and making it easier for you to flush the bacteria out when you pee. Pro Tip: D-Mannose will only work if your UTI is caused by E. coli. There is no guarantee that D-Mannose will help you, which is why it is considered a supplement, not an OTC drug. While not every pharmacy sells D-Mannose, you can definitely find it in holistic pharmacies and stores that sell organic food and supplements (see Where to buy D-Mannose). #7 Natural plant-based antibacterials: Garlic, Uva Ursi. Allicin, isolated from garlic essential oil, has potency against bacterial biofilms and has demonstrated broad antibacterial activity. Every pharmacy has garlic supplements, but if all else fails, head to any grocery store and buy raw garlic instead. Raw garlic is as effective as a supplement and requires no prescription. Pro Tip: If you are using raw garlic, make sure to smash it well to release the Allicin. Also, make sure to eat garlic with food. You can take it before, after, or during a meal, but do not take it when you are fasting. Read about the correct dosage of garlic for UTI and precautions when using garlic to supplement your UTI treatment. Uva Ursi is another herbal supplement that is widely accepted (especially in Europe) as a natural supplement that could help you fight UTI-causing bacteria. 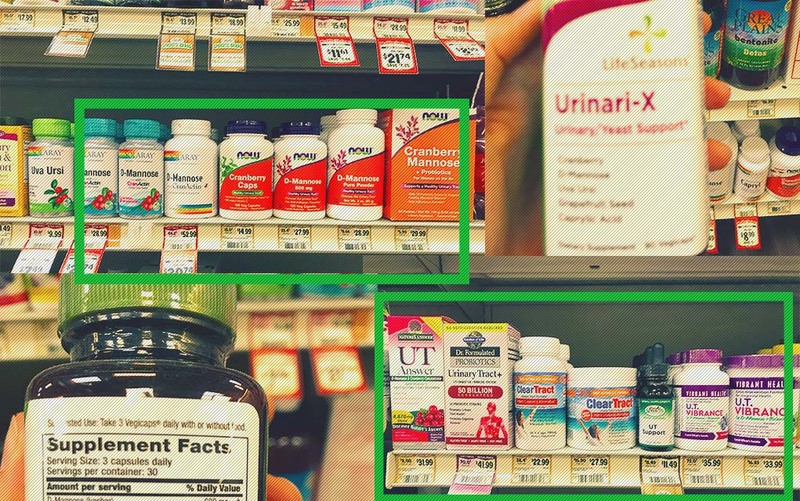 Learn how to pick the right Uva Ursi product and how to take it for UTI supplementation in this post: Uva Ursi Myths and Facts. UTI E-Drops is a European product, and it has been on the market in Central and Eastern Europe since the early 1980s. In December 2017, after three years of checking supporting data, Health Canada approved E-Drops Nano for distribution in North America. Homeopathy treats the whole patient, not a symptom or group of symptoms. If you ask a homeopath, they prefer to prescribe remedies based on individual patient assessment, not just isolated symptoms. Therefore, a homeopathic doctor would prefer to prescribe you a remedy uniquely addressing your individual health needs. Purchasing an off-the-shelf remedy is considered to be less effective than taking one recommended specifically for you. However, there are several widely-recognized homeopathic UTI OTC remedies readily available. Many naturopathic doctors find the following remedies helpful for their patients with UTI symptoms. Advised for those who experience a constant, strong urge to urinate with a sharp pain right before and after peeing. Other symptoms include a sensation of bladder fullness but only being able to release a few drops of urine when peeing. This remedy is advised for those who feel a strong urge to urinate, burning or cramping pain in the bladder area, and an itching sensation while the urine passes. Other notable symptoms that can be helped include irritability, impatience, and feeling cold. This remedy is great if your symptoms are relieved by hot baths or with a hot bottle applied to your lower abdomen. This remedy is often useful in cystitis and may help when symptoms are unclear, or if other remedies have not been effective. However, it is crucial to address the reason you had a UTI happened in the first place. There are multiple factors that can make you more prone to UTIs, such as certain contraceptive methods (a certain type of condoms, lube, IUD), diseases that affect vaginal health (BV or yeast infection) etc. Therefore, a holistic approach to UTI prevention is more effective than just treating an acute infection. What’s your favorite OTC UTI remedy that worked for you? When I had a UTI (just experienced it once), what I did is I drink lots of water, eat smashed raw garlic and fruits, then take a bath at least 2-3 times a day. After a week, the pain is gone and am back to normal.